Trees enhance the aesthetic of your apartment property. Trees are important part of the environment especially when they are well kept and maintained on your property. When trees start to decay, have diseased-infected limbs, and loose hanging branches they can become an eyesore for your tenants. Trees next to an apartment building or on the property can add beauty and shade, but they can also become a problem when branches grow too big or too weak due to disease. When your apartment property, tenants, residents and passing pedestrians are threatened by over-grown trees or diseased-infected branches, it’s best to be proactive and hire the handiwork of Orlando Tree service to get that tree removed. If you think your tree on your property needs to come down, you want to move fast! Seeing a tree deteriorate or slowly decay on your property is heartbreaking to watch. Don’t let decay-producing fungi such as mushrooms grow at the base of the trunk or cracks in bark take away the splendid beauty of the landscape of your property. Every tree is either an asset to keep or liability. So, removing a tree from your landscape property – your life could be a difficult experience to encounter. Imagine looking out your living room window, expecting to see the gorgeous, big oak tree that once occupied the far right corner of your property. Rather than watching its branches sway in the early sunrise cool breeze, you’d be observing an open, empty space hanging over freshly dug dirt where the tree’s roots once grew. Trees have numerous benefits that occur physically, emotionally and mentally. Trees add everyday happiness we feel in their presence that often matters the most. However, when a tree poses risks to the people and objects in its surroundings, it’s sometimes safer to leave its fate in the hands of a professional tree service company. Whether you need a tree removal service for a construction project, or you need tree trimming to beautify your property, Advanced Tree Pros can tackle it. We have crews that have extensive training, skills, and equipment to handle any kind of tree service, from removing diseased branches, to tree stump removal, and to reshaping old growth of massive trees. There is no tree too big or too awkward to handle. With our massive crane, we’ll have the entire tree and remnants totally removed from your property in no time at all. 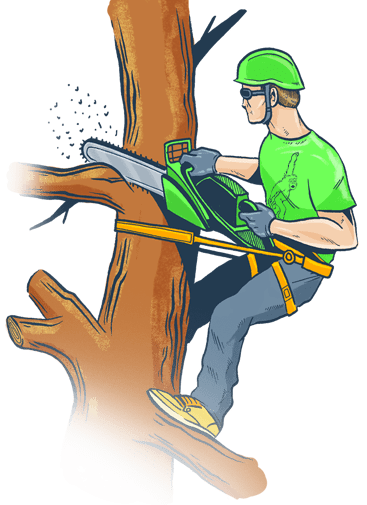 When it comes to taking care of the trees in on your property for your tenants or residents, some jobs are much too big and are just too dangerous or just need the help of Tree service Orlando. Wrong tree, wrong place- the tree might be planted too close to a home, apartment building or townhouse, driveway, under power lines and creating a safety hazard for your tenants or residents. A tree is dead or poses a threat to life or property. Tree trimming is proper pruning, as a preventative measure to keep loose hanging branches that are dead, too close to your property, or trees haven’t been trimmed in the last three years. Nothing is more important to us than the health and prosperity of your trees. When it comes to tree trimming and tree cutting trust Advance Tree Pros. With proper Orlando tree pruning, a tree’s health and even beauty can be preserved or enhanced. Even your property can be enhanced by having beautiful trees. Our ISA Certified arborists will know exactly what the best solution will be for your trees on your property. To properly take care of your trees on your property, you will need to find a company that has the experience, skills, and tree removal service prices in Orlando that fits into your budget. There are many factors that are called into question when it’s time to trim a tree or tree branch. Watch out for when a tree branch or tree may need to be removed from your rental property showing signs of diseased, dead or damaged branches, branches that pose safety hazards, low growing to the ground, sidewalk or driveway and growth that is too sparse on one side of the tree. Needing to remove that dead or diseased inflected tree from your property? No problem. Are you in a hurry to remove loose branches, overgrown stumps or damaged branches? We’re all over it. From our different services we provide, we can handle anything and everything you throw at us. Search to find Tree removal service near me check out Advanced Tree Pros. We let our team do the work for you!